Enchiladas are delicious. It’s like Mexican manicotti. They’re easy to make, but require a few steps which might be more than you’re willing to commit to during a normal week night. Making the filling, make the sauce, toast the tortillas, stuff and roll the tortillas, bake them, garnish them…. Each step is easy. Altogether though, it might take a few extra minutes. So without going through the entire process, I want to focus on the sauce. 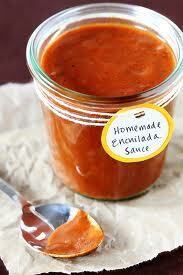 Enchilada sauce is one of the easier sauces to make, and hard to ruin. It’s easy enough to buy canned sauce, but if you show personal concern for dietary salt intake, I recommend going fresh. And, of course, it tastes better. The sauce can also be used for other purposes than enchiladas. Think Mexican night… Add some of the sauce to your taco meat, chicken fajita mix, as carne asada sauce, burrito sauce, etc. It’s highly versatile and takes other flavors very well. For example, if you want a spicy sauce for your carne asada, add a little more pepper in the sauce. Smokey? Use a touch of adobo or chipotle sauce. Highly seasoned for tacos? Add some cumin, mexican oregano, chili powder, cinnamon and hot sauce. You get the point, the sauce is easily modified. 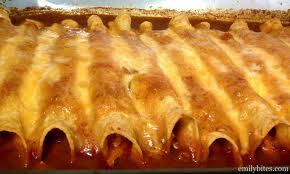 But, as is; as I am writing it, it’s perfect for enchiladas. Bring a few cups of water to a boil. Remove from the heat and place the peppers in the hot water. Let steep until soft. Remove the peppers and remove any skin that will easily pull away (no need to remove everything). Reserve the peppers and the water. In a medium heavy bottom sauce pot, begin cooking down the onions and tomatoes in the vegetable oil. Season lightly with salt and pepper. Add the softened peppers, chocolate, chicken base and sugar. Cook for another minute or two to let everything blend well. Add enough of the reserved pepper water to just cover everything. Bring to a simmer and let simmer over low heat until slightly reduced. Remove from heat. Transfer to a blender and blend until very smooth (be careful blending hot product – make sure to cover the top of the blender with a dry kitchen towel, or wait a few minutes to let it cool). Return the puree to the pot and continue to simmer until it becomes a thick sauce. If it’s too thick, add a few tbsp of the pepper water. Check seasoning and adjust with salt and pepper if necessary. Occasionally, I will place about 1/2 a bunch of cilantro leaves in the blender to infuse the flavor into the sauce. Use right away, or cool quickly and store. The sauce will keep for about a week if stored properly.